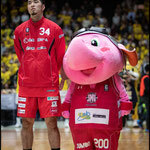 It's not like the Chiba Jets had to go too far back to recall a similar dire situation. 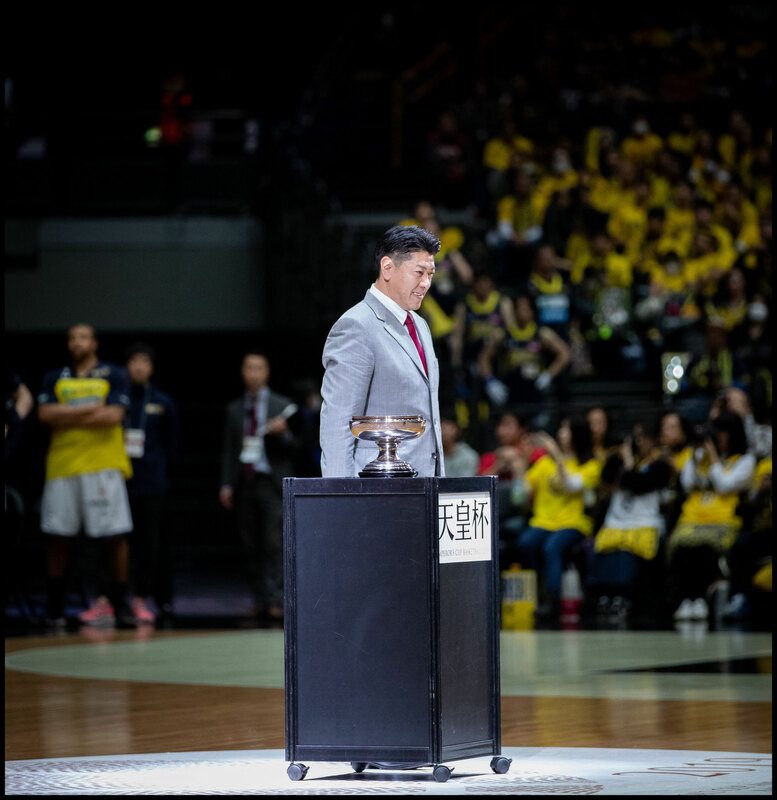 It had happened just the day before. 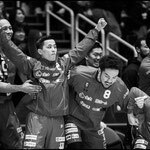 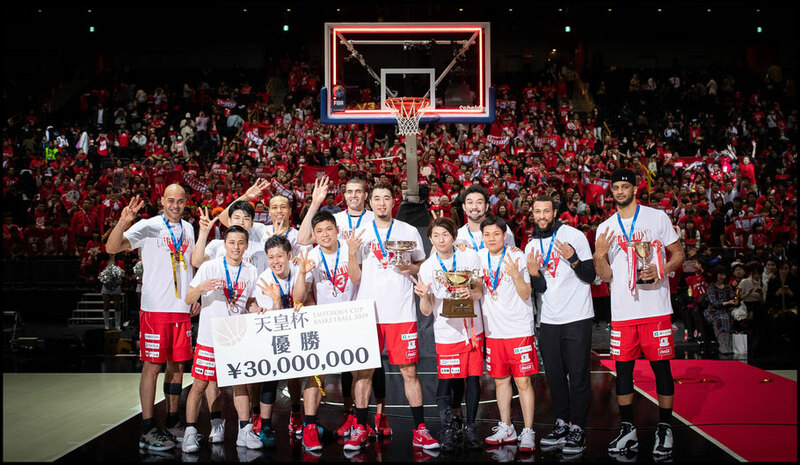 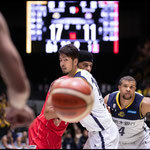 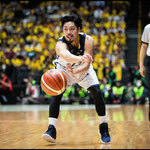 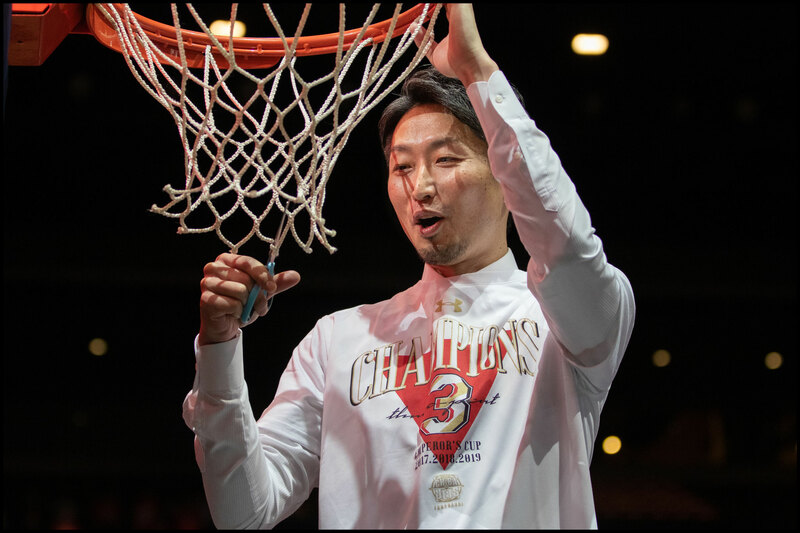 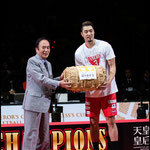 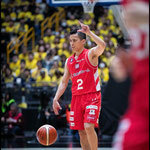 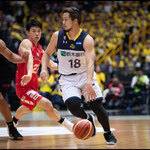 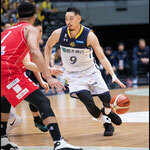 And just like in the semifinals, the Jets pulled out a dramatic victory on a last-second basket, this time a 3-pointer in overtime by Yuki Togashi that gave them a 71-69 win over the Tochigi Brex on Sunday and their third straight men's title at the All-Japan basketball championships. 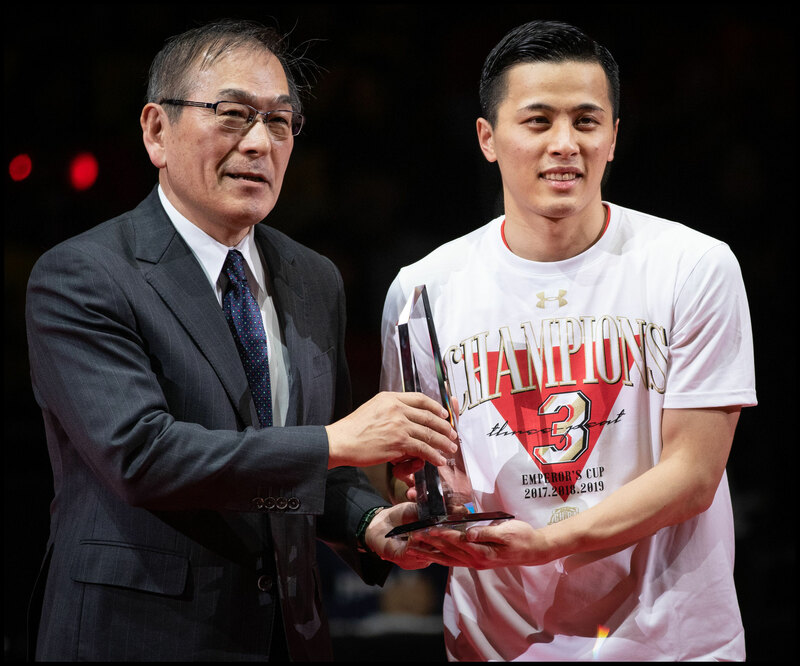 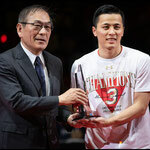 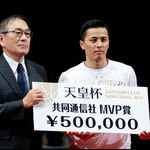 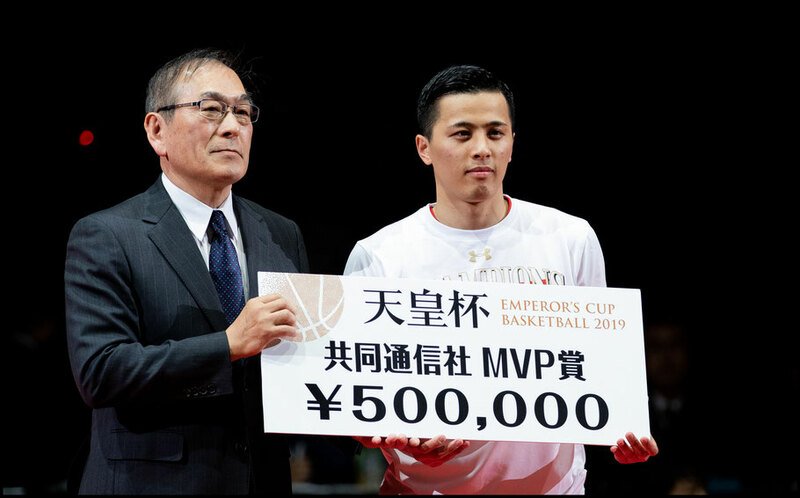 "Yesterday, we scored with 0.5 seconds [left] for a come-from-behind win," said Togashi, who was named the tournament MVP. 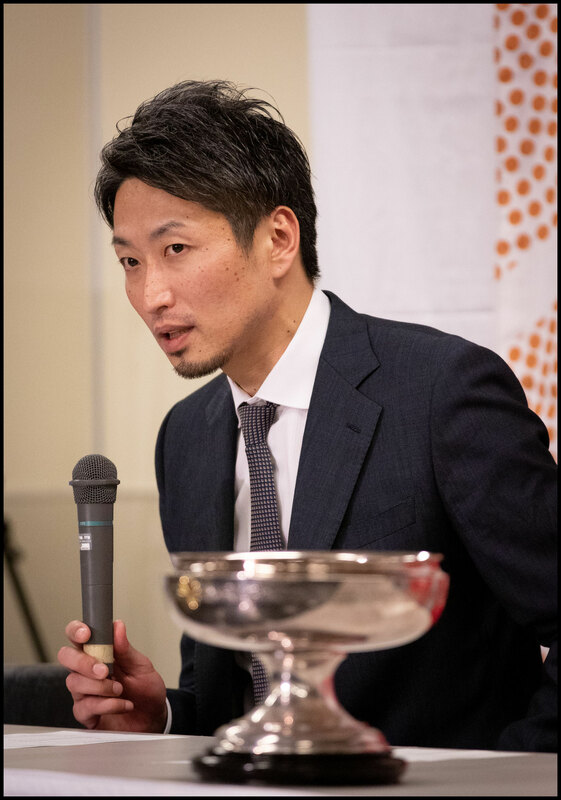 "To win like this two days in a row, that's something that won't happen again in my lifetime." 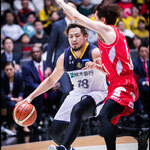 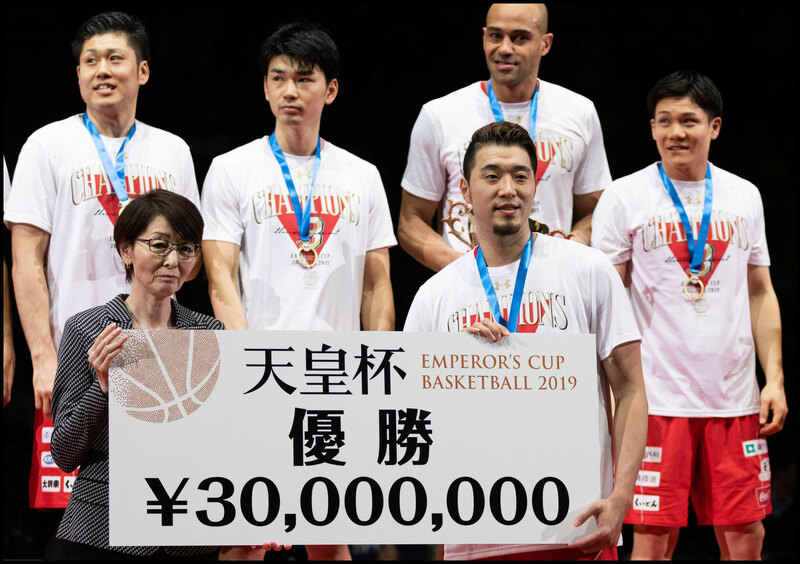 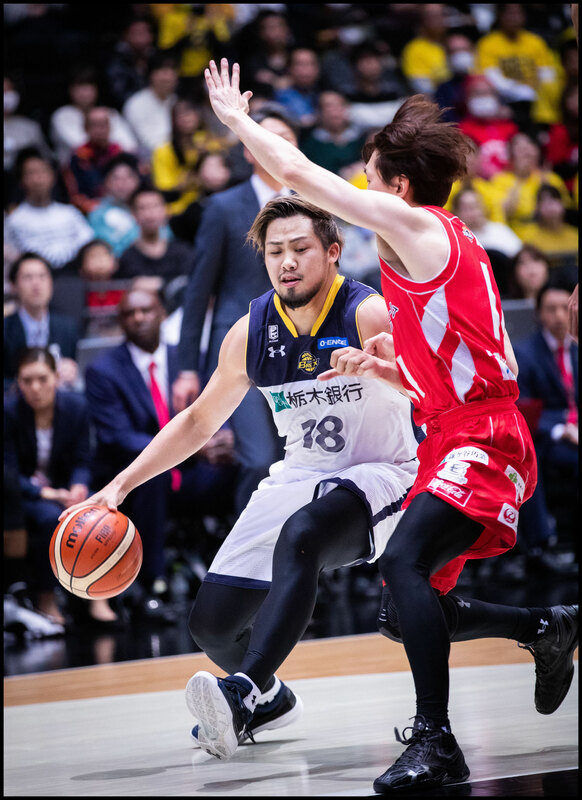 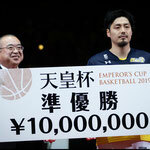 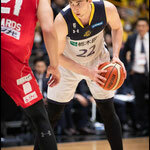 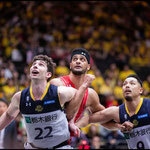 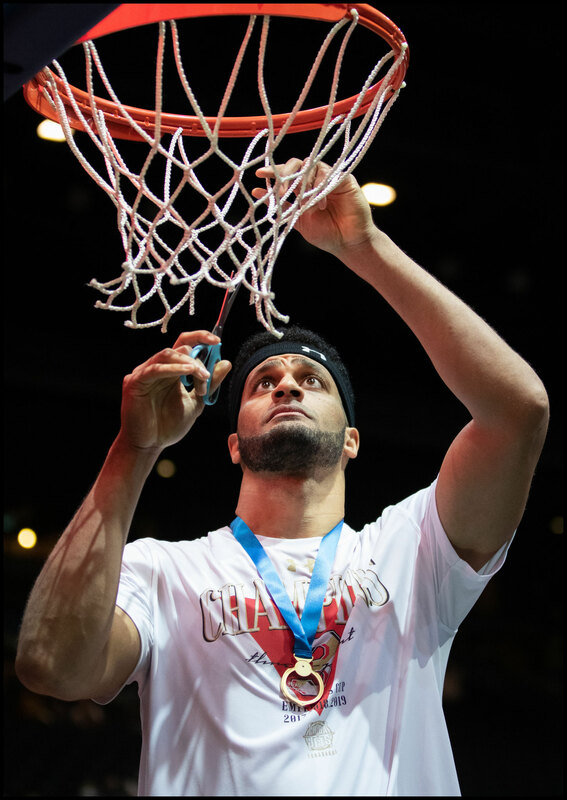 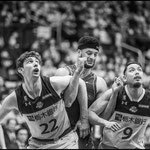 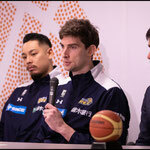 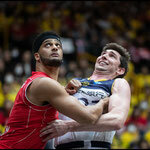 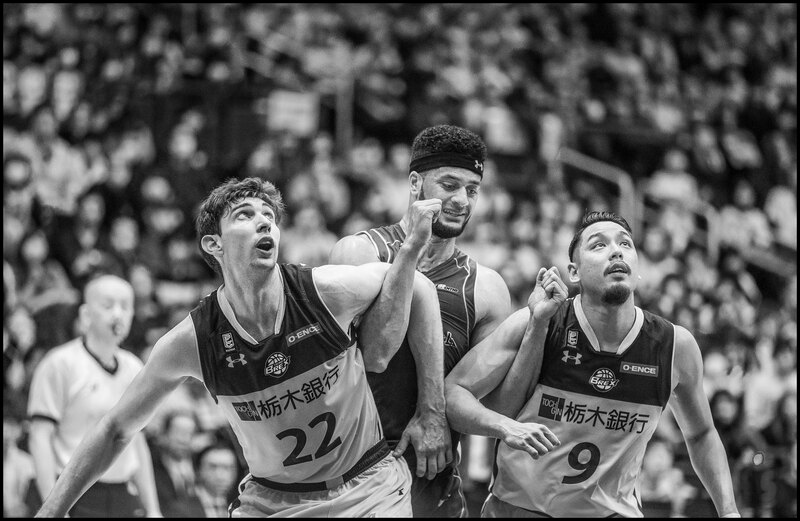 Gavin Edwards scored 27 points and grabbed 11 rebounds for the Jets, who became the seventh team in the 94-year history of the tournament, also known as the Emperor's Cup, to win three straight, and the first since Aisin (now Mikawa) won four in a row in 2008-11. 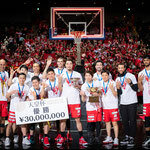 Combined with the JX Eneos Sunflowers' victory in the women's final earlier in the day at Saitama Super Arena, it gave Chiba Prefecture-based teams a sweep of the titles for the third straight year. 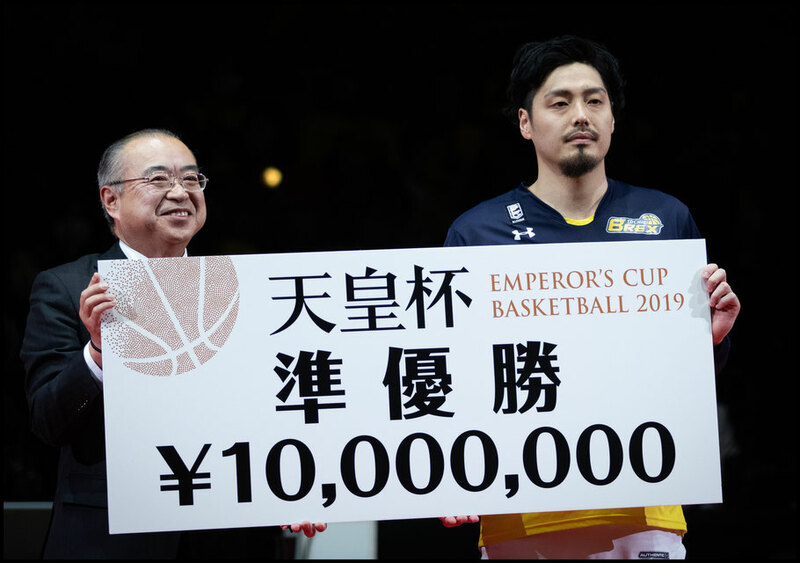 For Togashi, hitting the winning shot with 2.6 seconds left on the clock, and earning the Jets the top prize of ¥30 million, made up for what had been a dismal day shooting. 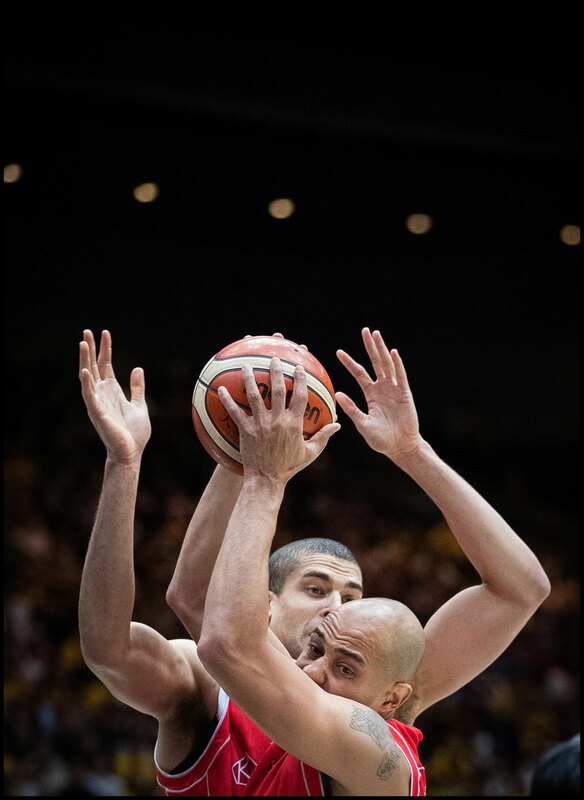 Prior to that winner, he had made just 1 of 10 shots. 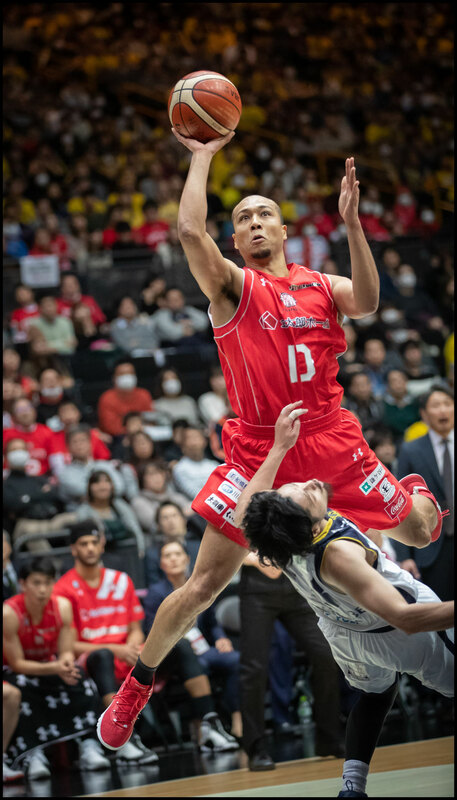 With a chance to win the game at the end of regulation time, the spunky 1.67-meter guard also had the ball stripped away by power forward Jeff Gibbs, preserving a tie and sending the game into overtime. 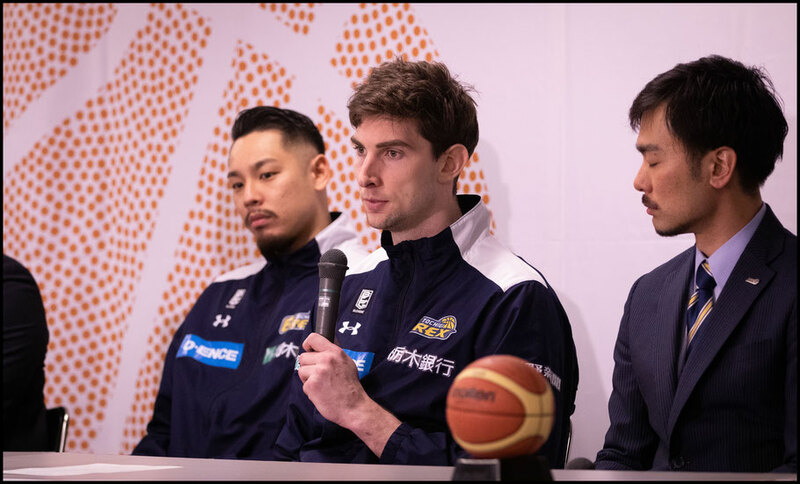 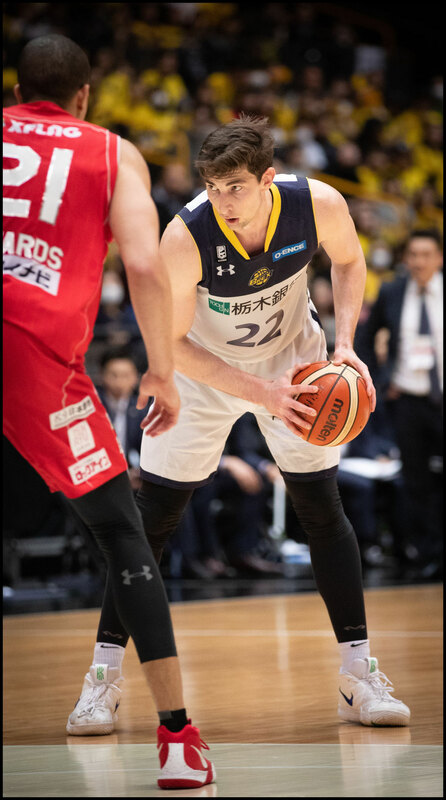 "At the end of the day, that was the only 3 he made, so I guess he was due," said Tochigi center Ryan Rossiter, who scored 23 points and had a game-high 19 rebounds. 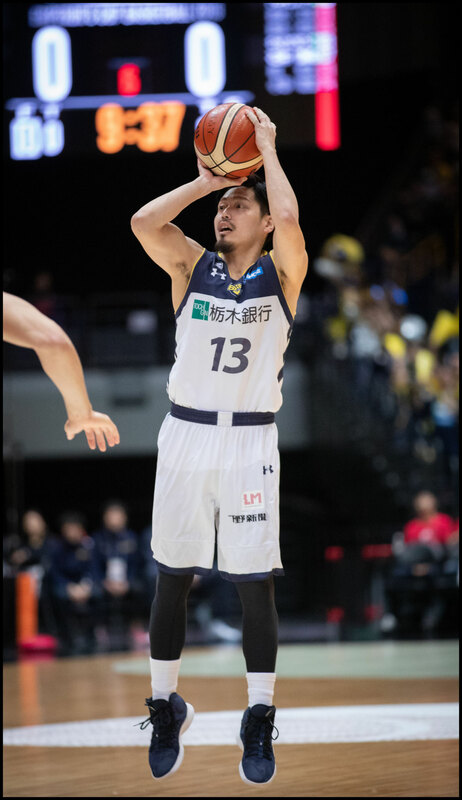 "But 0-for-4 [on 3-pointers, with just] 2 points up to that point. 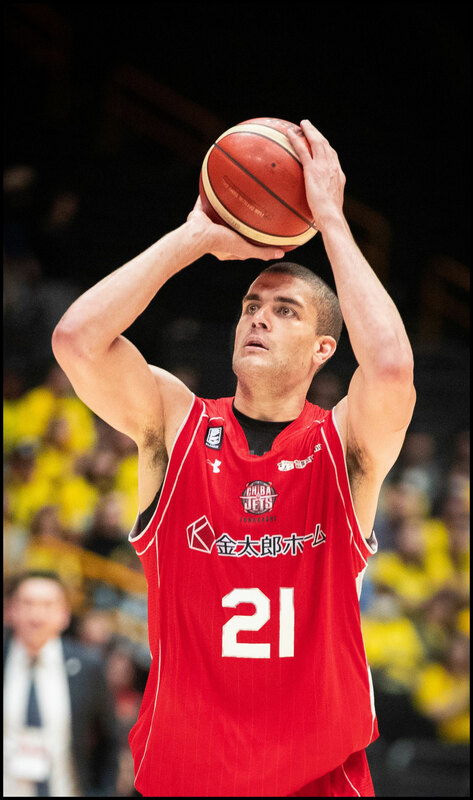 He's a great player, but that's who you want taking the shot if you're the defensive team, a guy that's got 2 points after 30 minutes," said Rossiter, who added he did not actually see the shot as he was preparing for a possible rebound. 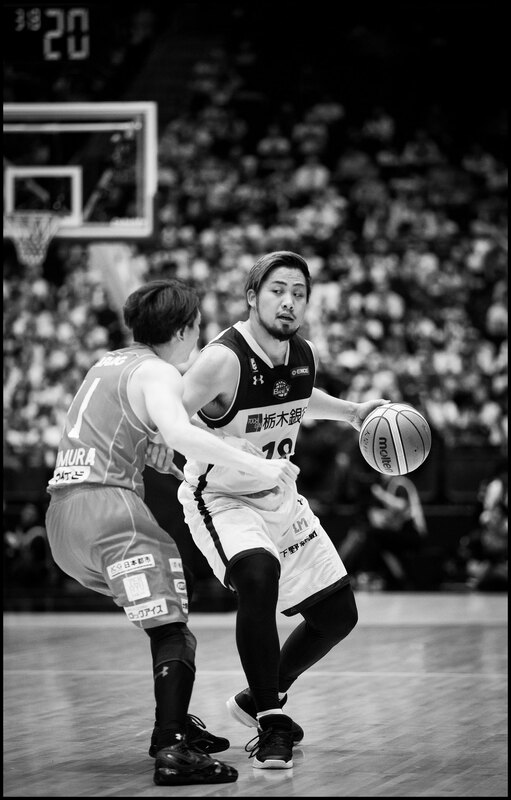 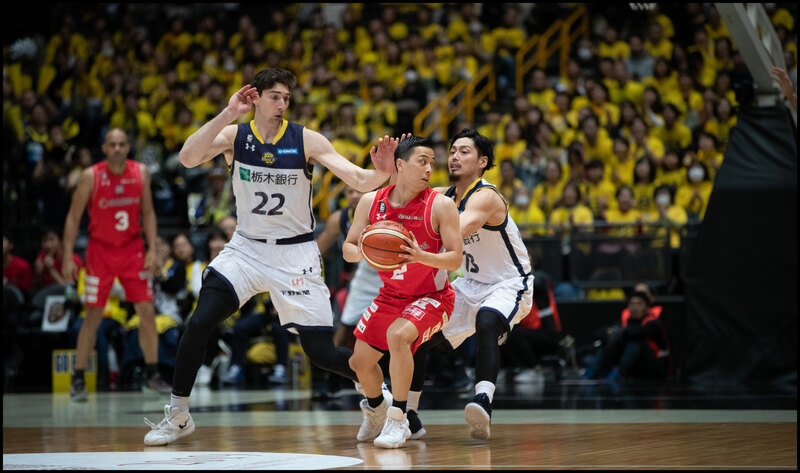 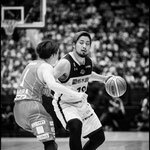 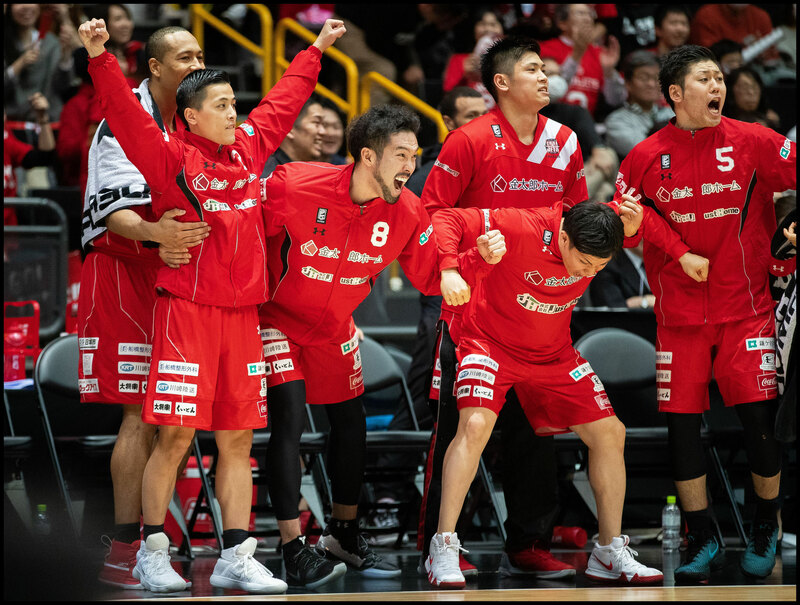 The clash was a battle between the teams with the best records in the B.League this season, with Chiba leading the East Division at 26-5 and Tochigi second at 25-6. 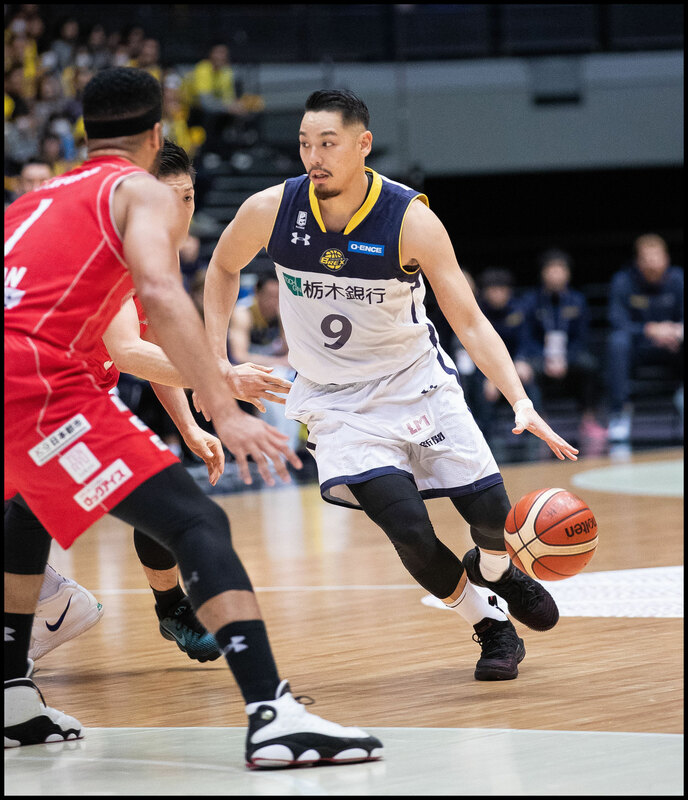 They had met previously this season, with the Brex winning 73-61 on Nov. 7, and as fate has it, were scheduled to play again Jan. 16 when the league resumed. 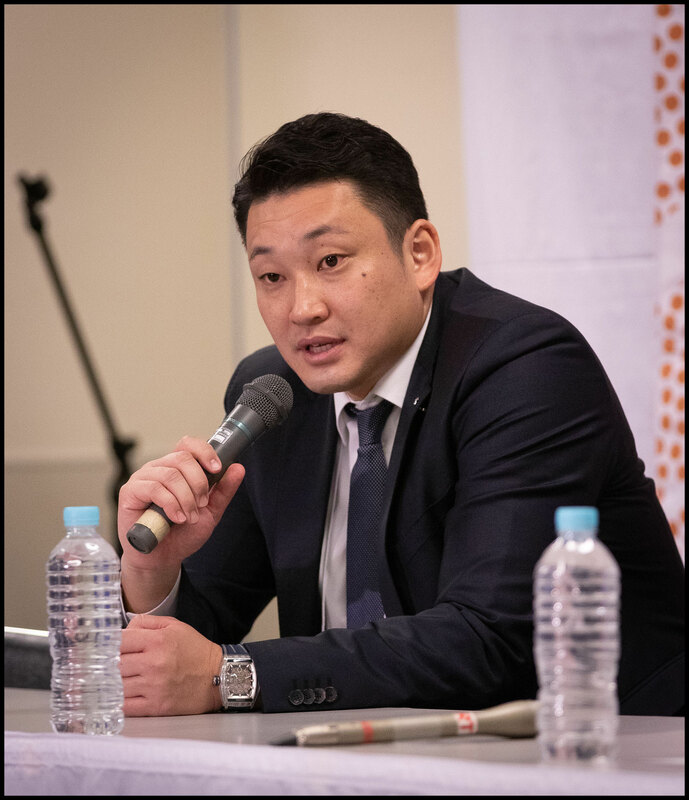 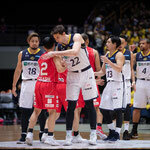 But the latest meeting in what is developing into one of Japan basketball's top rivalries never would have happened had the Jets not pulled off a minor miracle the day before. 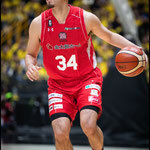 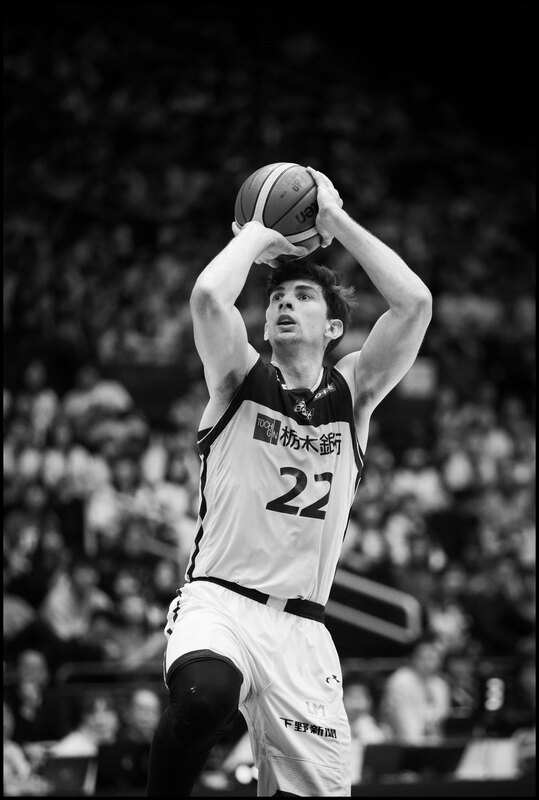 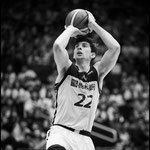 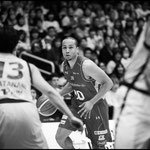 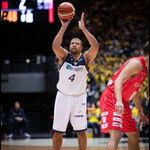 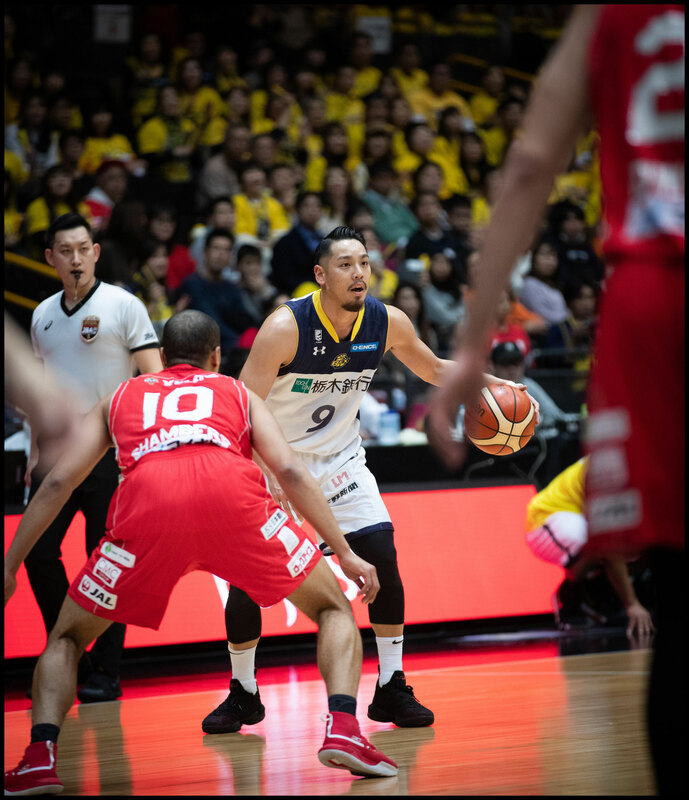 In the semifinal, against defending B.League champion Alvark Tokyo, the Jets were down 79-78 when Michael Parker blocked a shot, then at the other end, put back his own missed shot with 0.5 seconds left for an 80-79 victory. 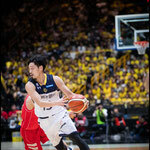 Tochigi meanwhile eliminated Kyoto Hannaryz 71-62 in the other semifinal. 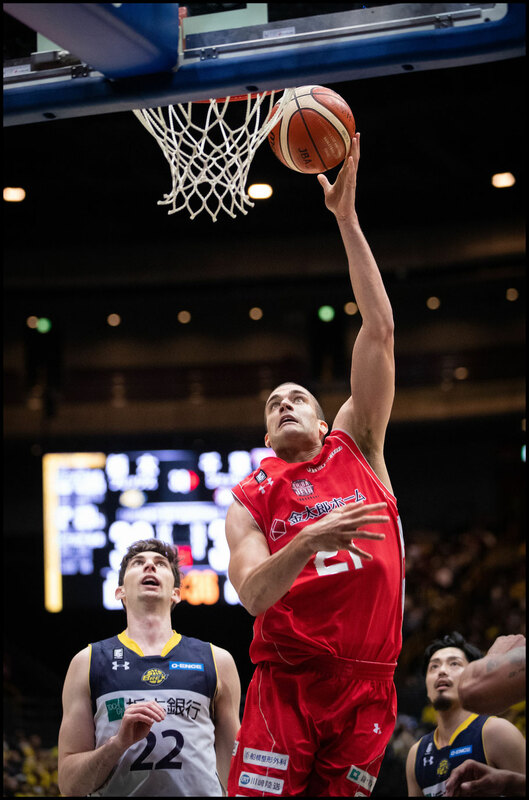 Like Togashi, Parker knew the team had beaten very long odds to win back-to-back games on last-second shots. 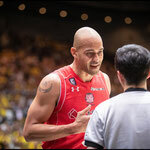 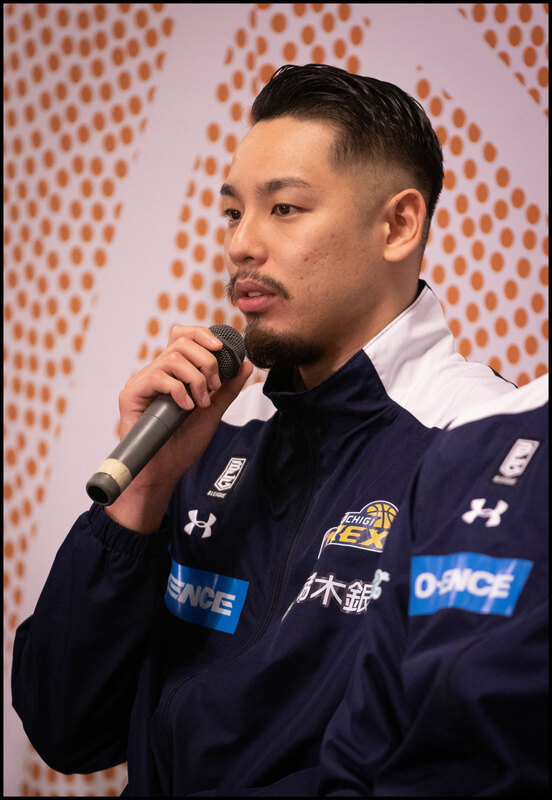 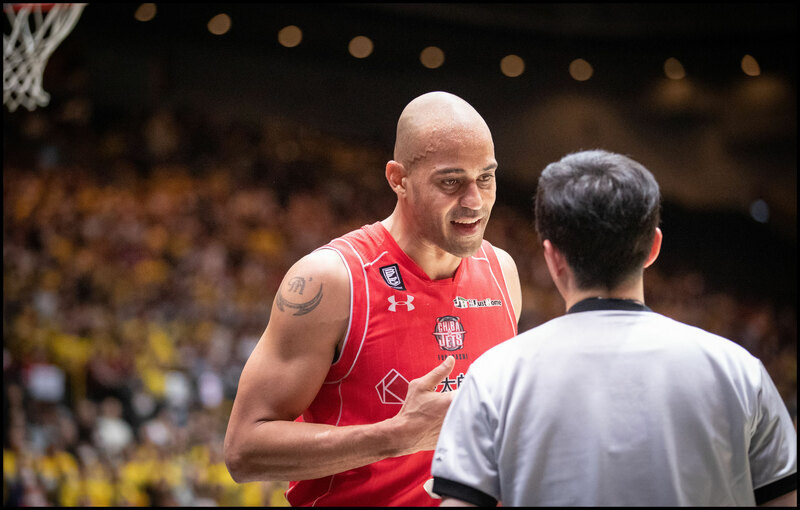 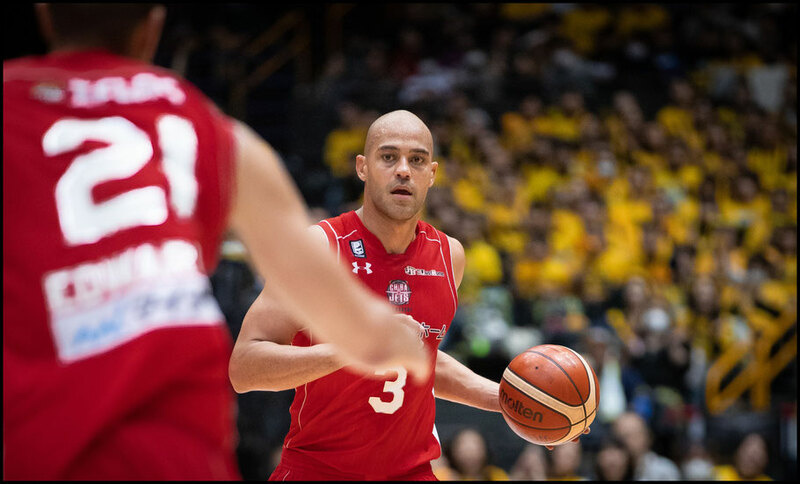 "I've never seen two days in a row like that with a single-elimination tournament," the 37-year-old Parker, who grabbed 14 rebounds against Tochigi. 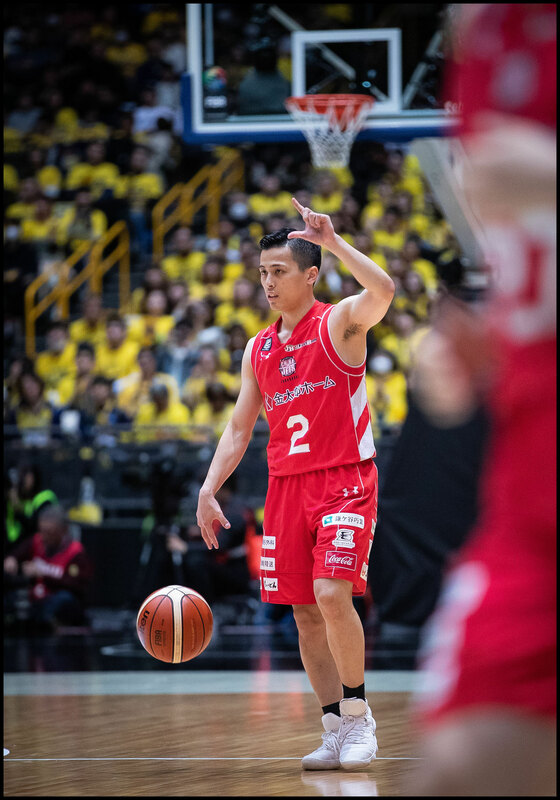 "Down by 1 in both, last possessions, and end up winning both games. 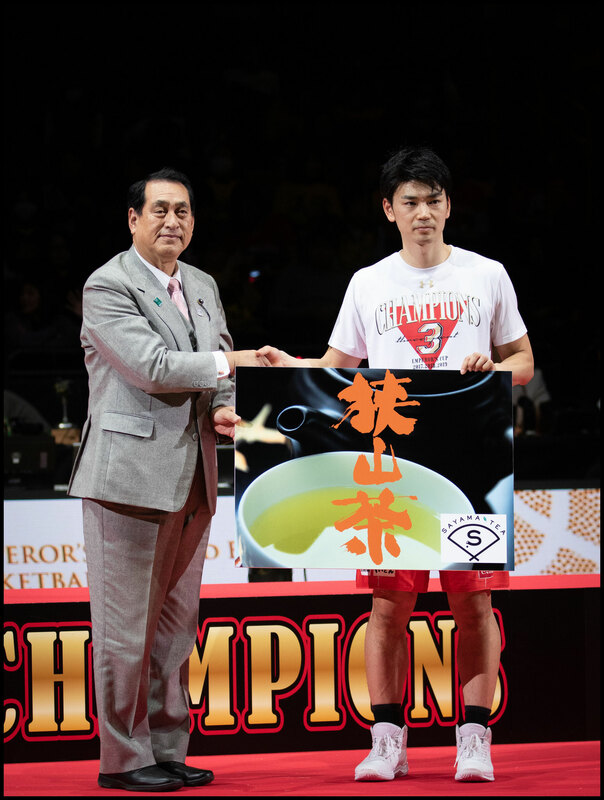 It's pretty amazing." 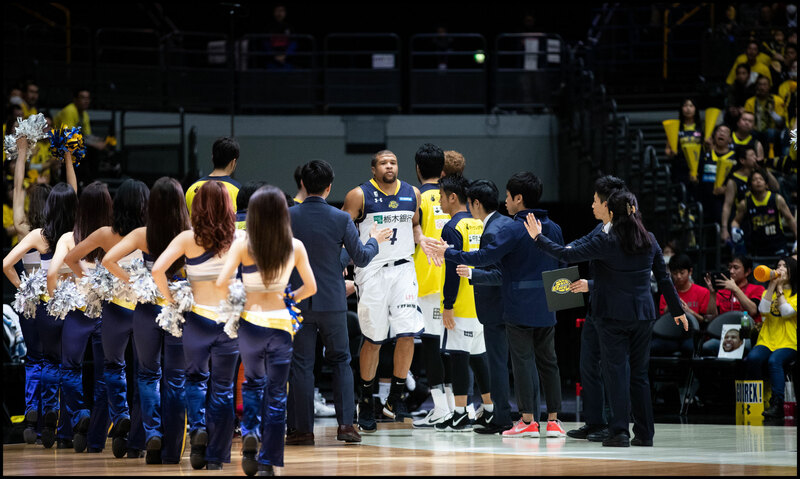 Add in a close 66-63 victory over Kawasaki Brave Thunders in the quarterfinals on Jan. 10, and it was a physically exhausting four days. "It's one of those things where it's depending on who you're playing," Parker said. 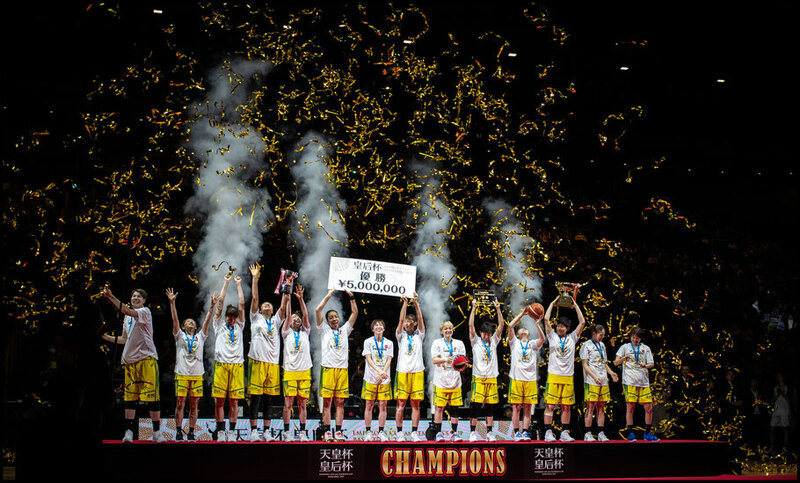 "Ours was tough. 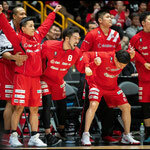 We had Toshiba [Kawasaki], Toyota [Tokyo], Tochigi. 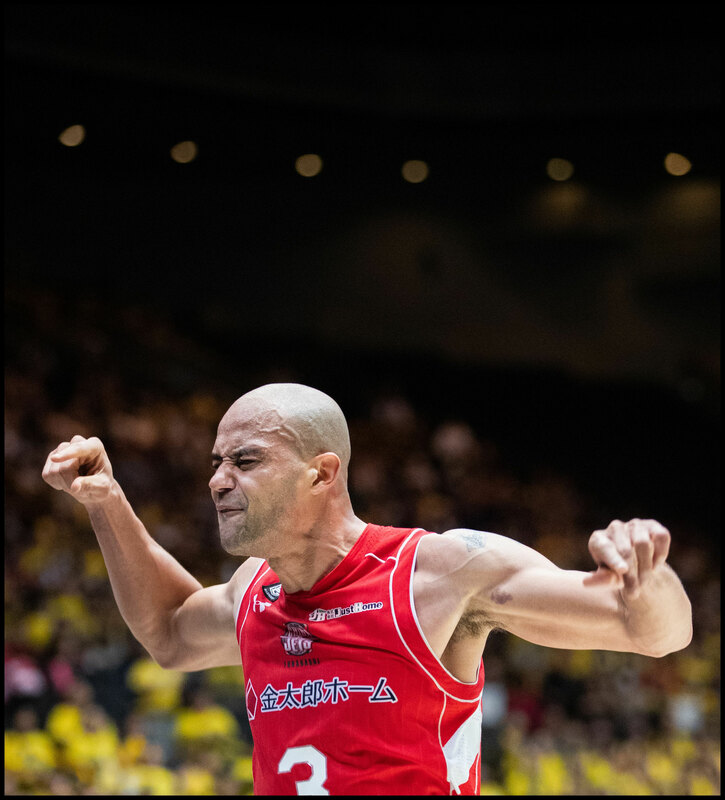 Very tough. 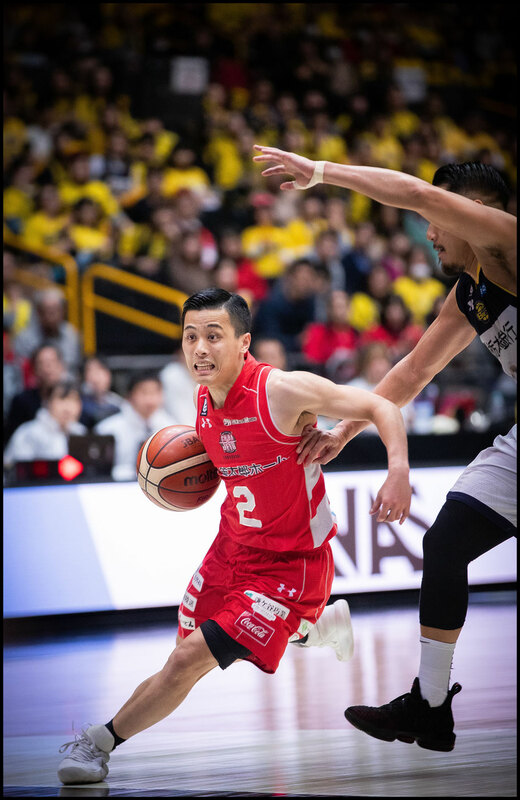 If we could get two easy games, it might not be as hard. 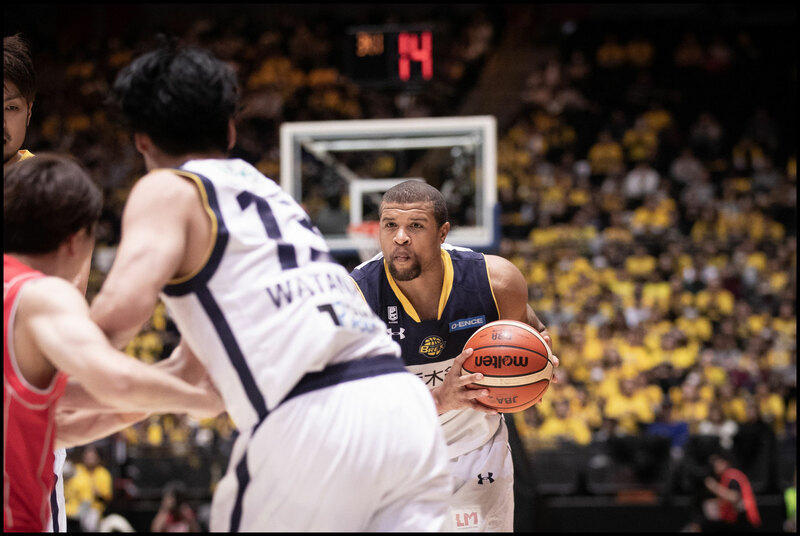 You might not have to sweat it out. 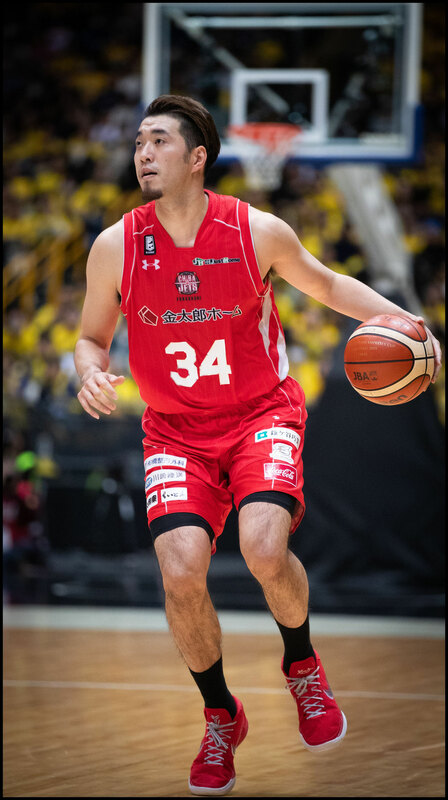 Last night we had to sweat it out, too. 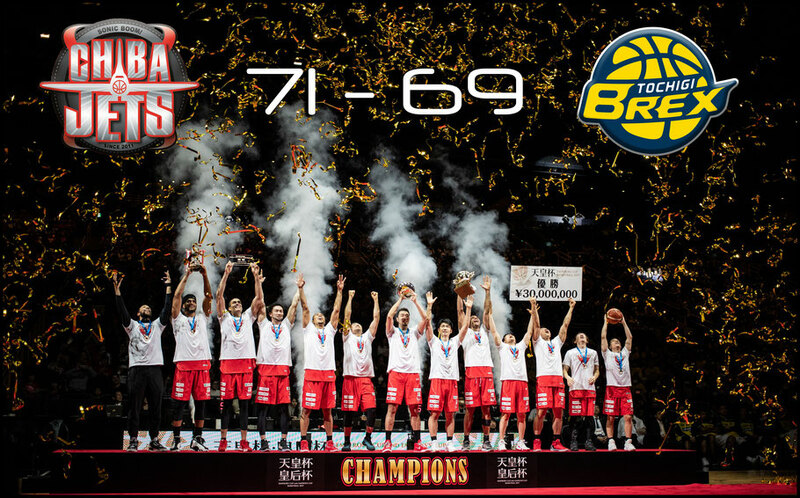 And then tonight went to overtime, so it's like, wow. 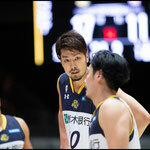 "And then, we have a game on Wednesday, against Tochigi. 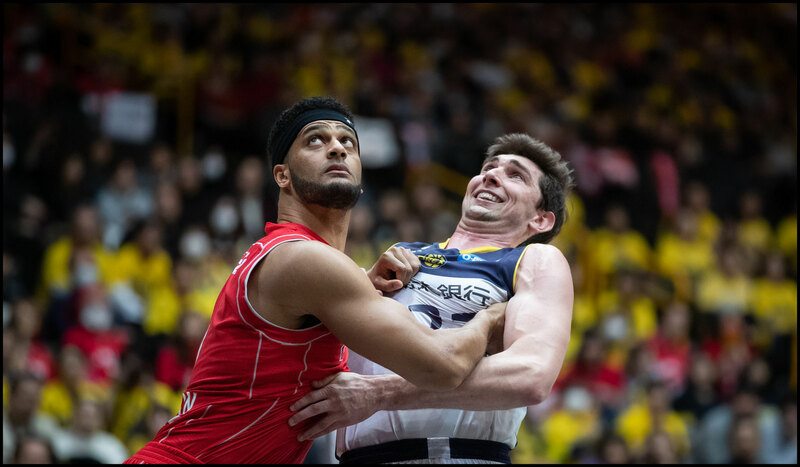 That's just how this season's schedule is going. 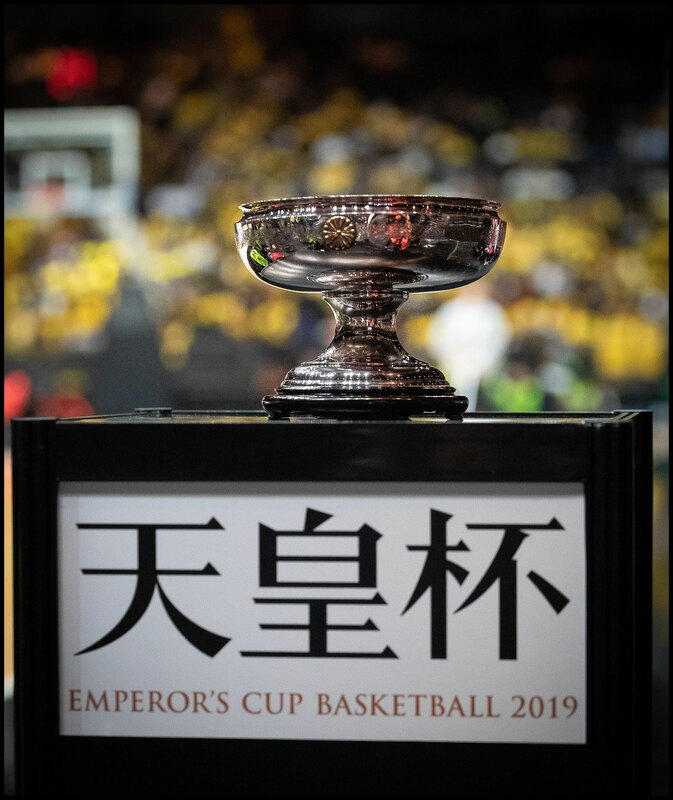 But that's what you got to do to win it. 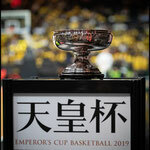 And that's what we did to win it." 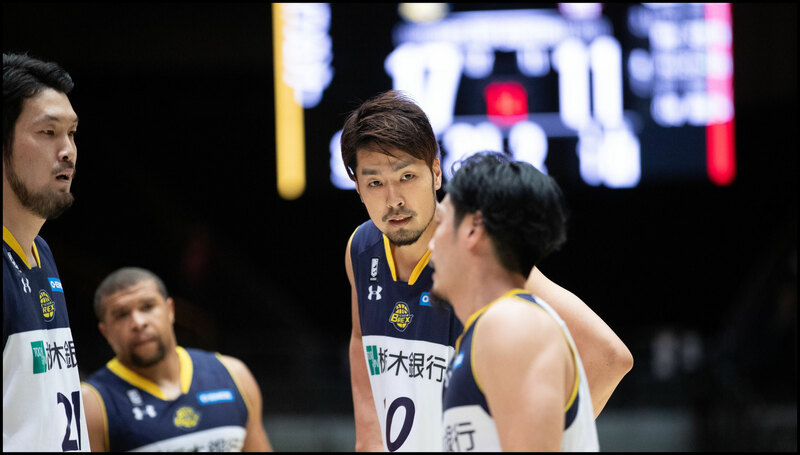 The demanding tournament schedule was tough on both teams, but Tochigi, which earned ¥10 million as runner-up, likely felt it harder, having just nine players in uniform due to injuries and using only eight. 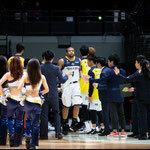 Four of its starters played 34 or more minutes, while only two of the Jets starters did so. 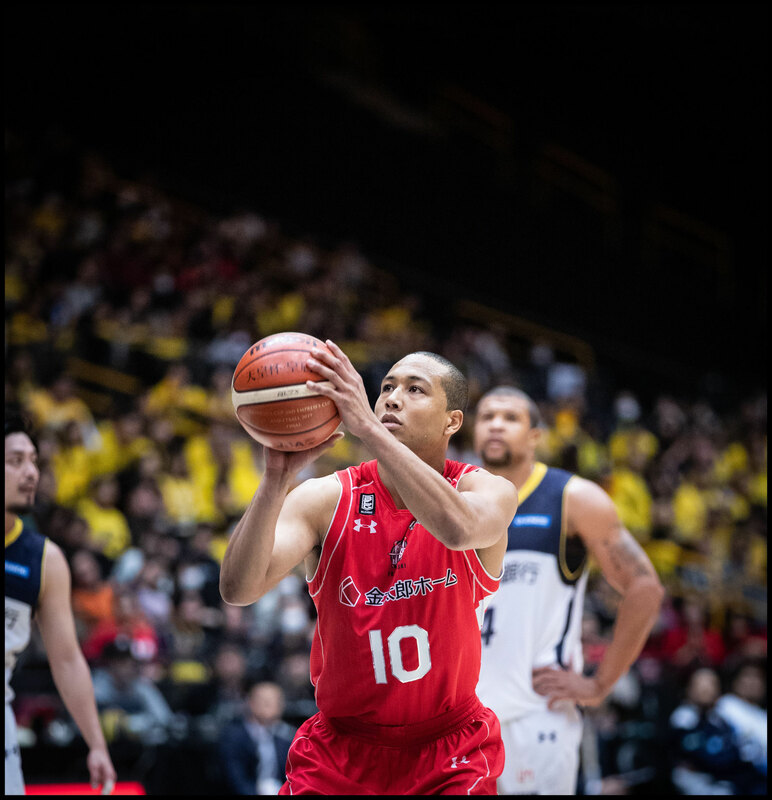 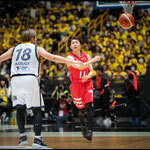 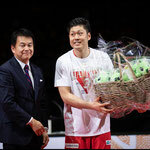 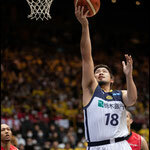 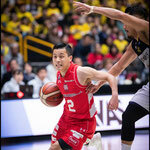 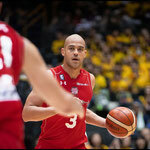 Gibbs and Yusuke Endo had 13 points apiece, while Kosuke Takeuchi and Seiji Ikaruga chipped in 10 points each. 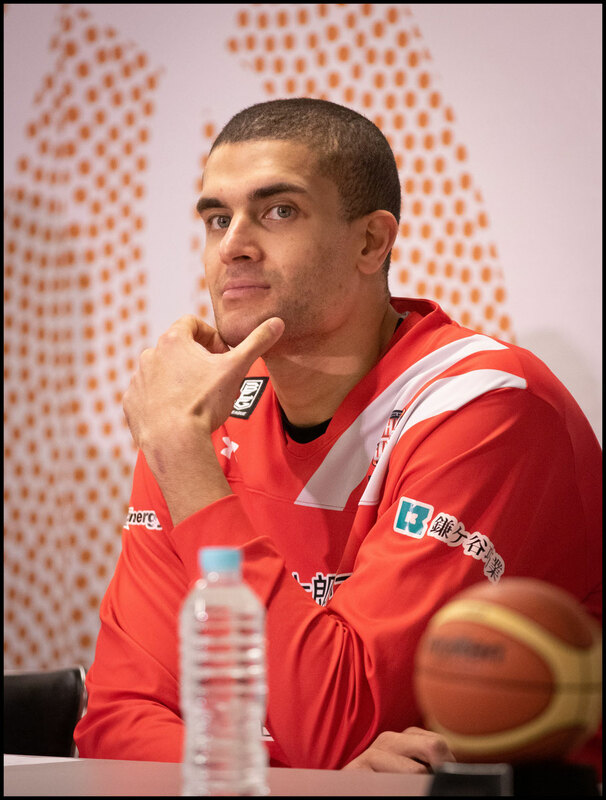 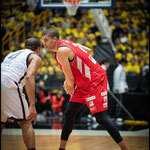 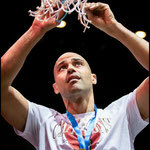 "At the end of the day, only having a four-man bench is tough, especially for the bigs," Rossiter said. 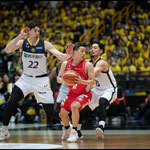 "Guards are pushing the ball up. 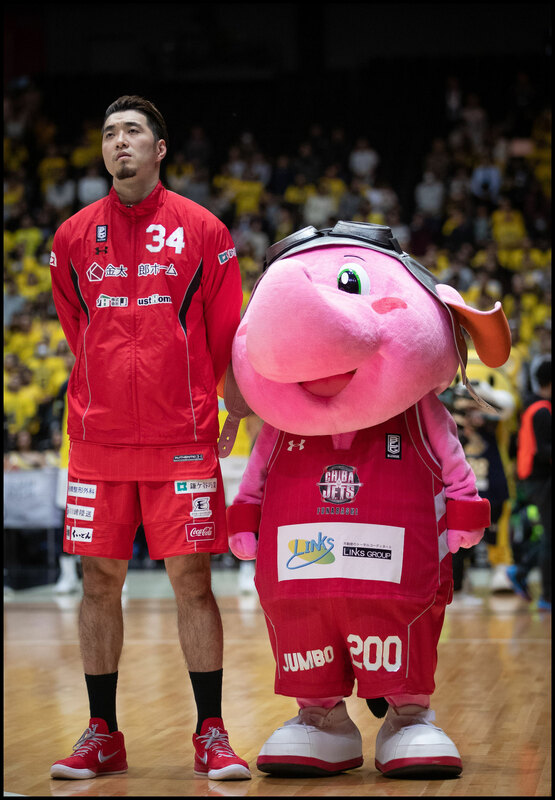 Chiba is probably the deepest team in the league, so they're just running fresh bodies at you. 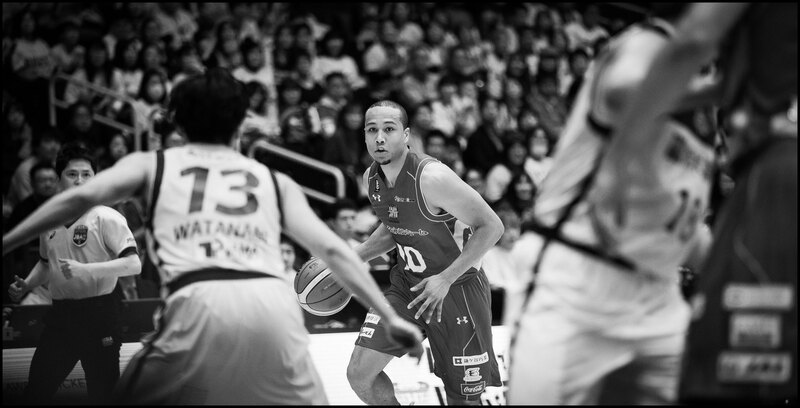 It definitely wears you down, but that's not why we lost." 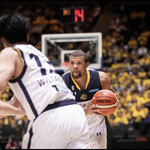 Edwards sympathized with the Brex playing short-handed. 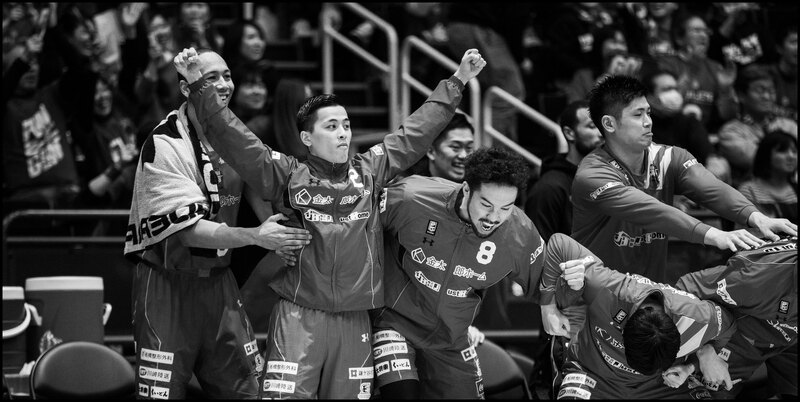 "That throws off your entire strategy as far as what you prepare for, what you can do as a team. 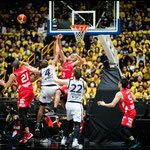 It definitely takes away from their game plan for sure." 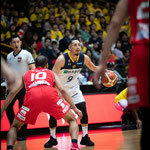 Fatigue might have played a role in a remarkable inability by both teams, but particularly Tochigi, to make free throws down the stretch, which led to the tie score at the end of regulation. 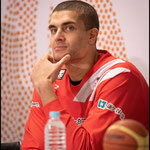 "A lot of minutes, a lot of games," Edwards said. 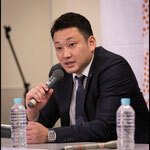 "Definitely a little bit of fatigue. 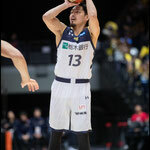 To be honest with you, we're not a great free throw shooting team, either." 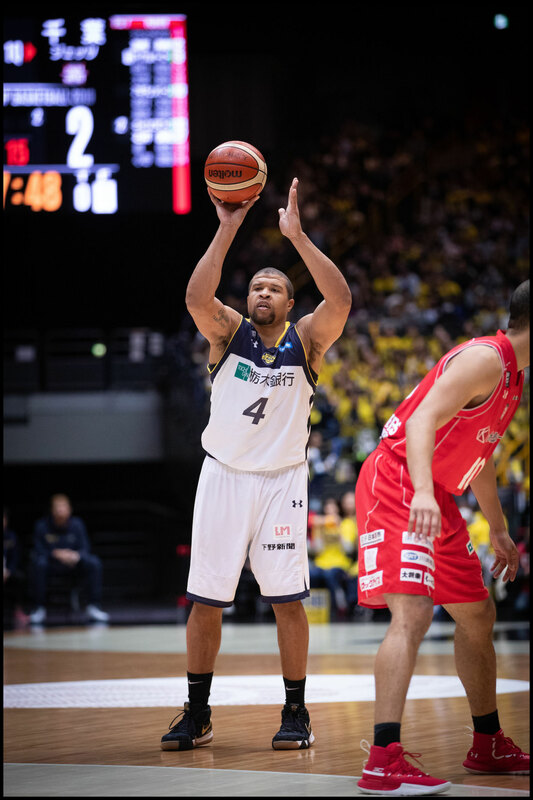 The Brex were way off, making just 11 of 22 free throws---in the fourth quarter alone, Gibbs missed 1 of 2 shots from the line three times. 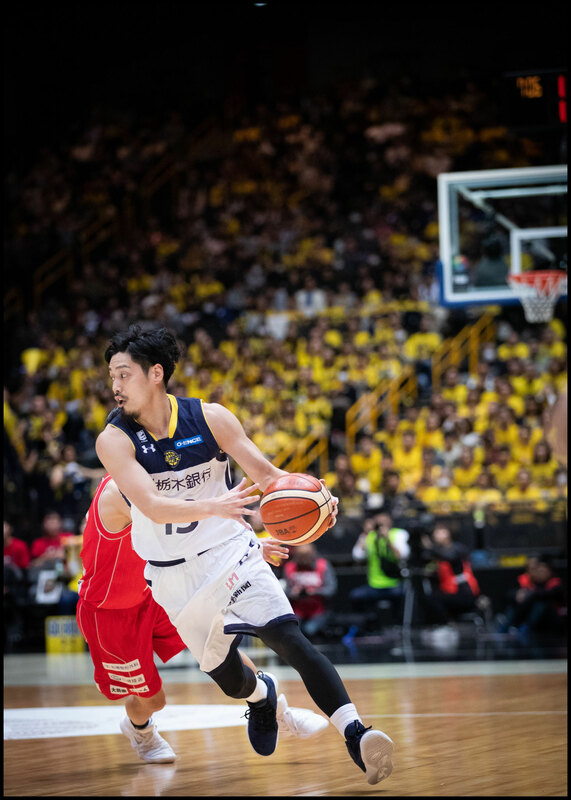 The last one came with 0: 15 left in regulation to leave the game tied at 60-60, although he made amends with his steal during Togashi's late drive. 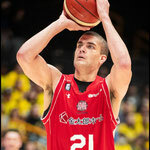 "It was huge," Rossiter said of the missed free throws. 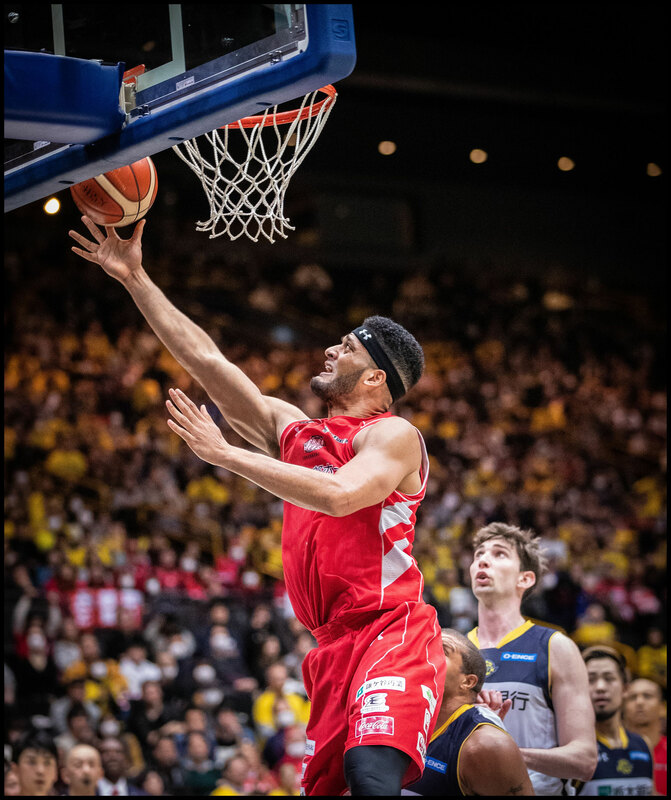 "We were still in a position to win with our defense, but we just didn't get the stop. 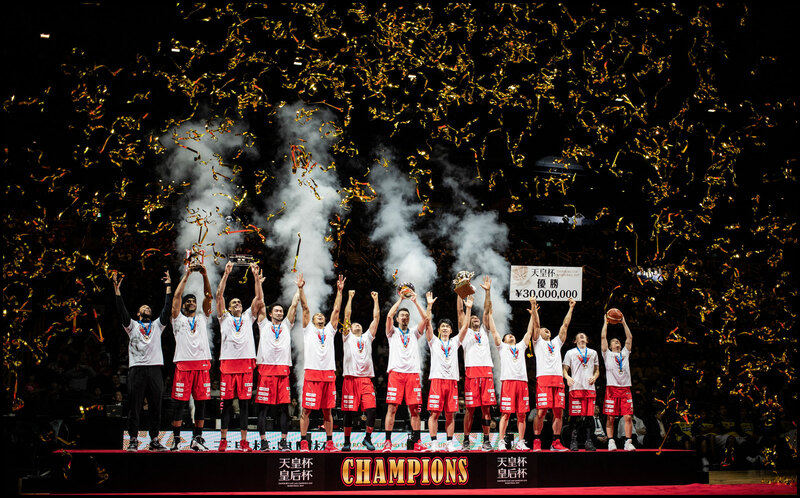 They made plays, and they're the champions for that reason." 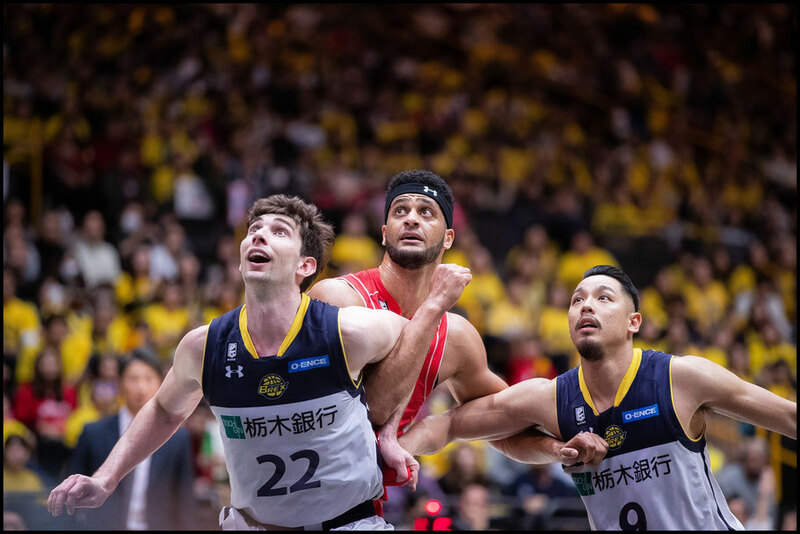 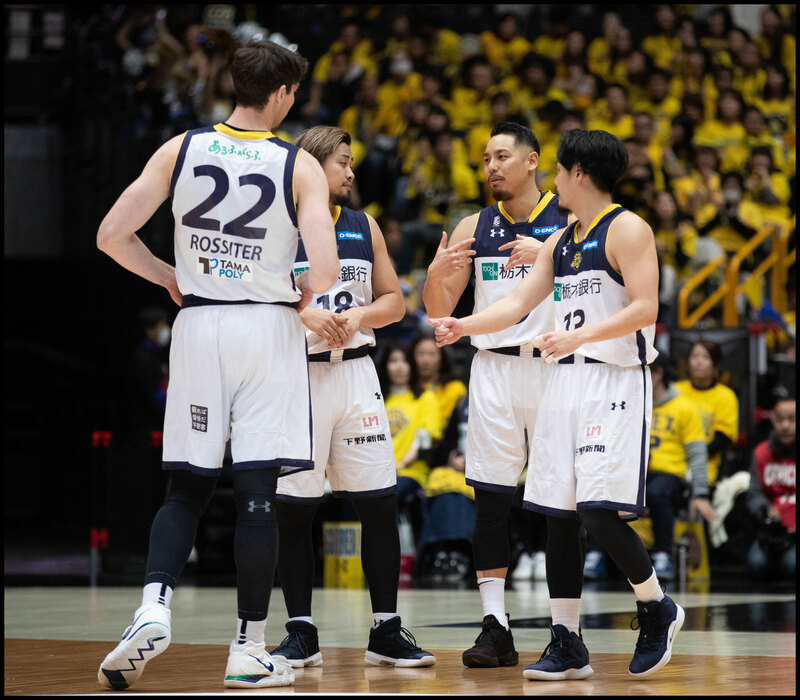 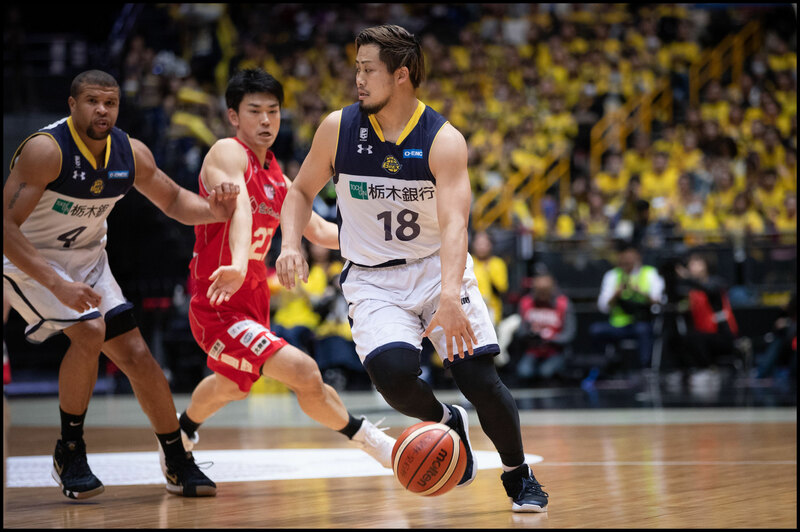 The Brex, whose only other trip to the final resulted in a loss to Aisin Mikawa in 2016, led 67-66 in the final minute of overtime when Rossiter himself missed a pair of free throws. 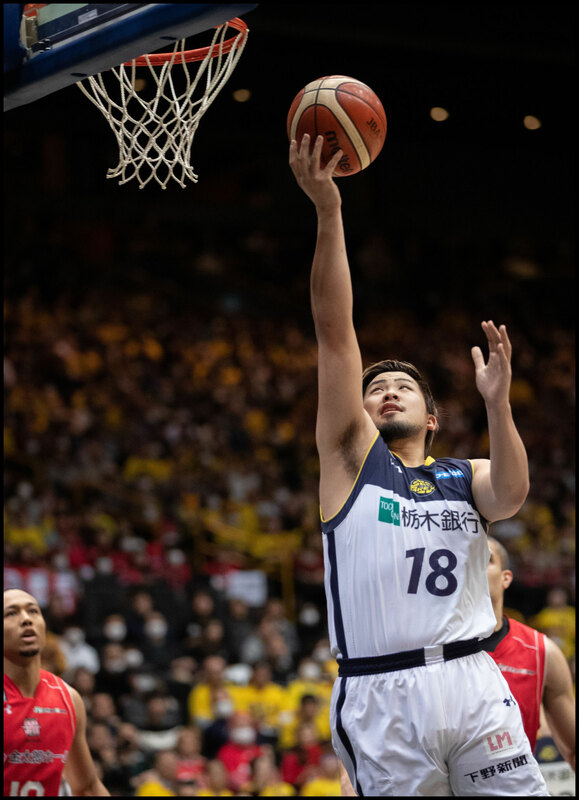 Tochigi grabbed the rebound on the second one - 23 of its 51 rebounds were off the offensive boards - but failed to score. 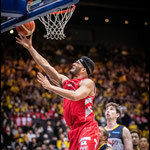 With 0:28 left, Edwards scored on a put-back to give the Jets the lead, only for Rossiter to find the mark from the free throw line and sink two shots to put the Brex up 69-68 with 16.1 seconds left. 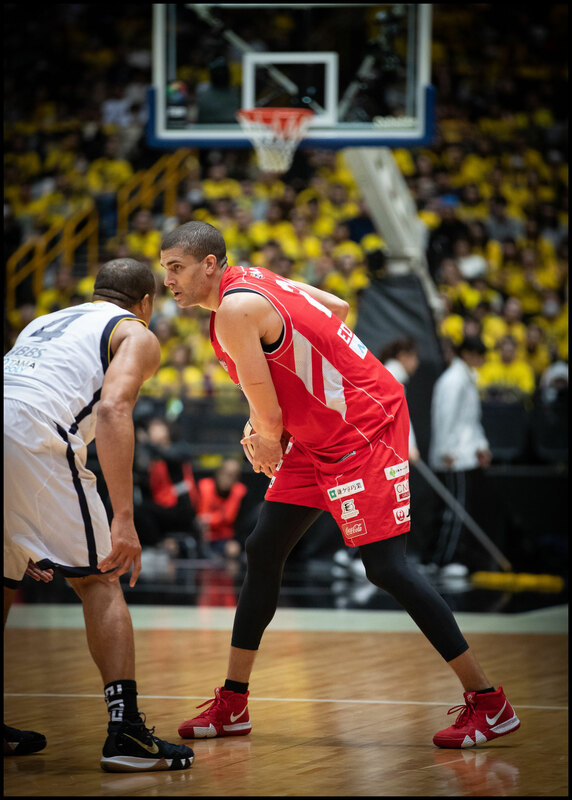 "Gavin killed it tonight," Parker said of his 30-year-old teammate. 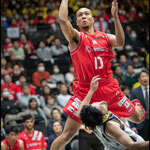 "He had a good put-back, he was shooting 3s really well, he just played super-good tonight. 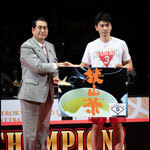 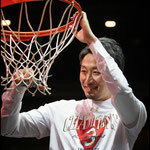 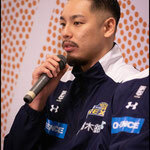 In fact, he kept us in the game, for Yuki to be able to hit that shot." 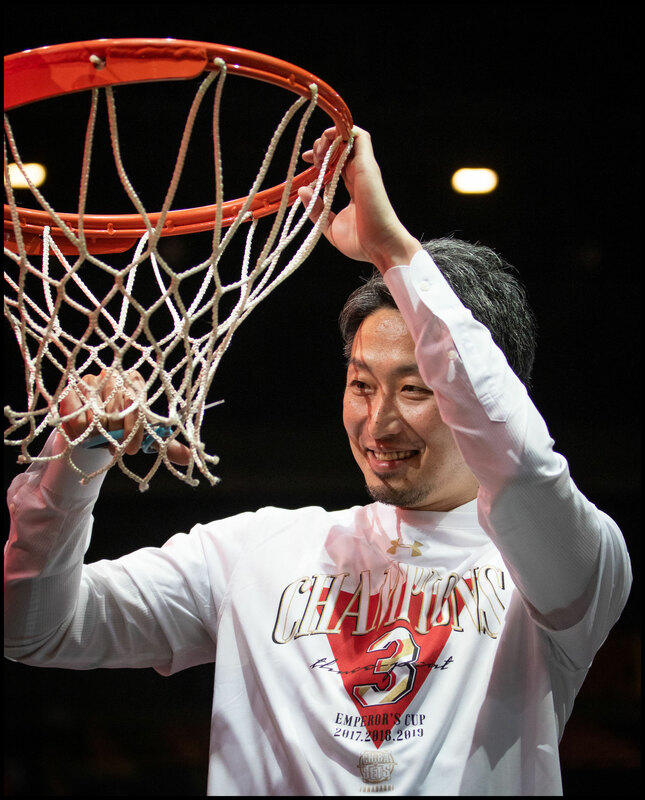 As the clock ticked down, Togashi dribbled in the middle just inside the halfcourt line, eyeing the defense and plotting his move. 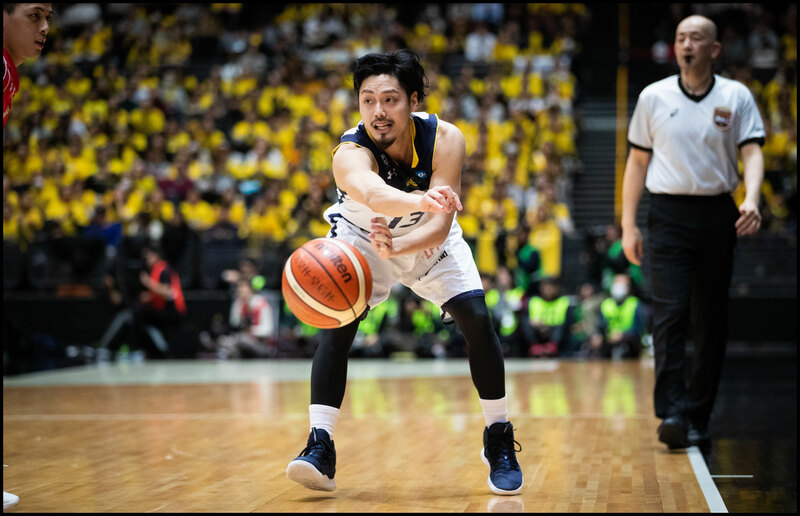 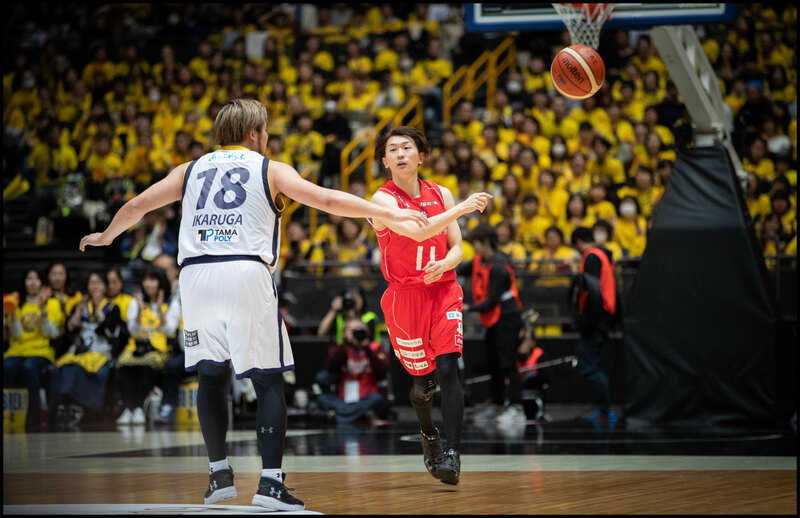 As he shifted to his left, Tochigi's 2.06-meter Kosuke Takeuchi stepped back to cut off the lane, while a teammate screened another Brex player to his right. 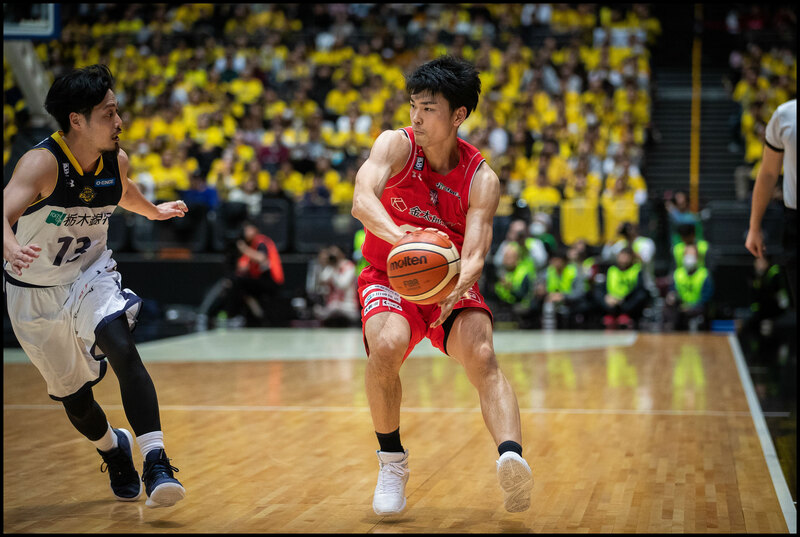 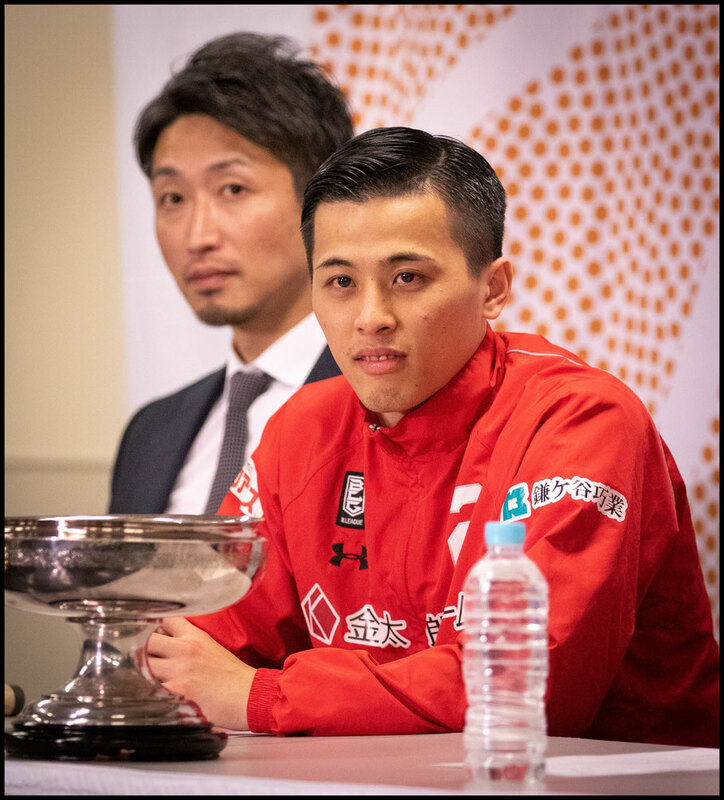 That was the opening Togashi was looking for, and he stepped up and launched a shot that hit nothing but net, sending the red-clad Jets fans in the packed arena into a frenzy. 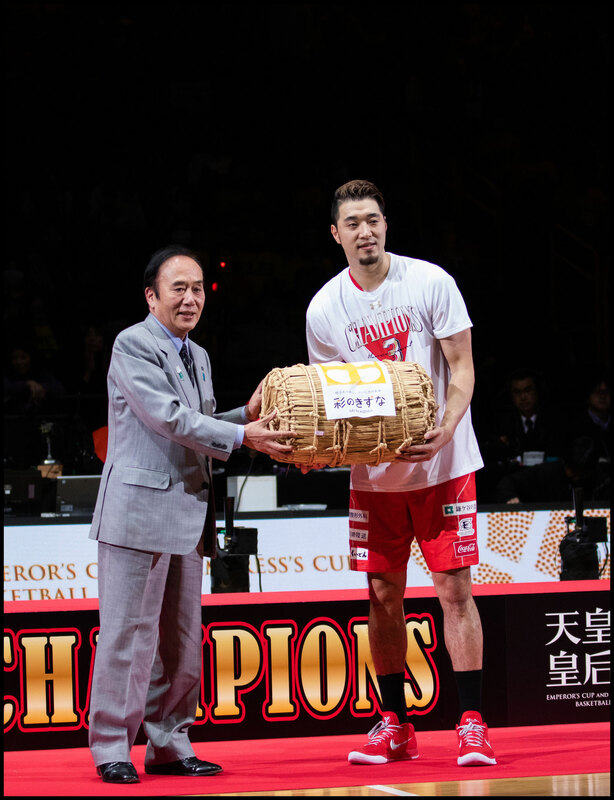 "I thought they would try for a trap, and if they did, I would pass it off," Togashi said. 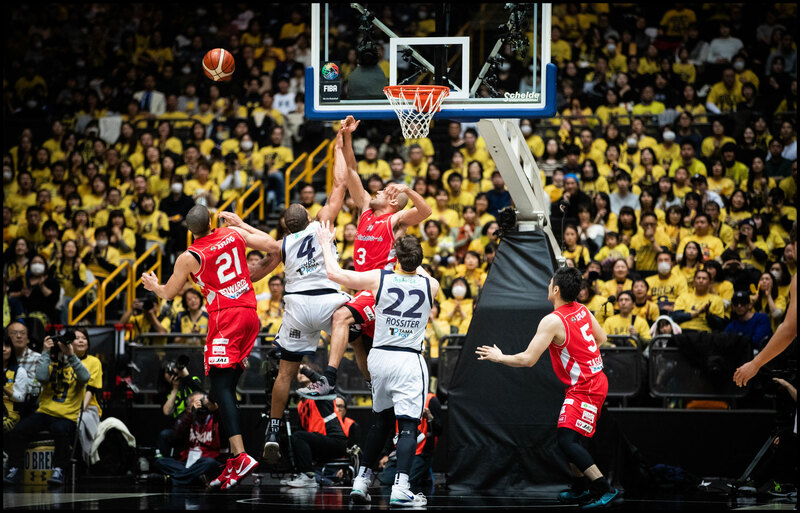 "But there was space in front of me and my teammate set a screen. 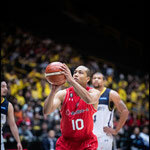 I was confident taking the shot." 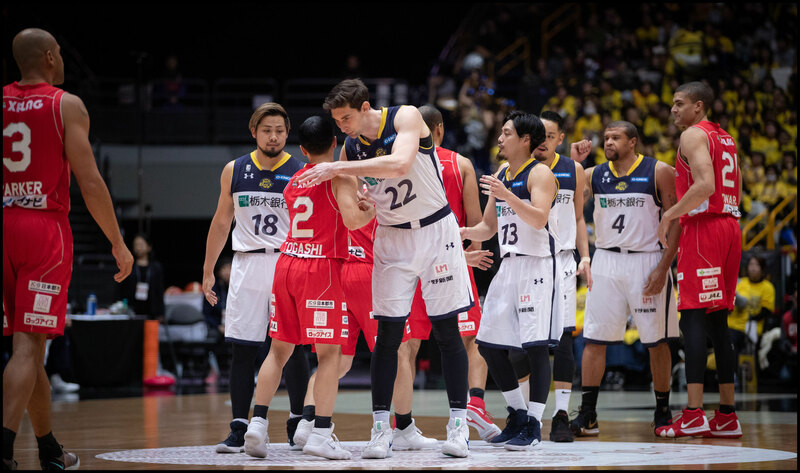 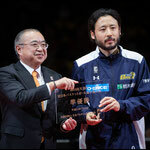 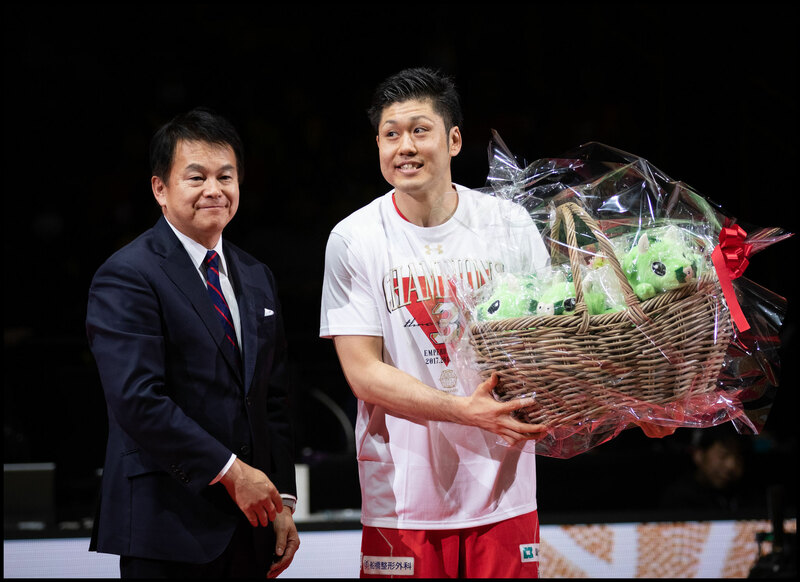 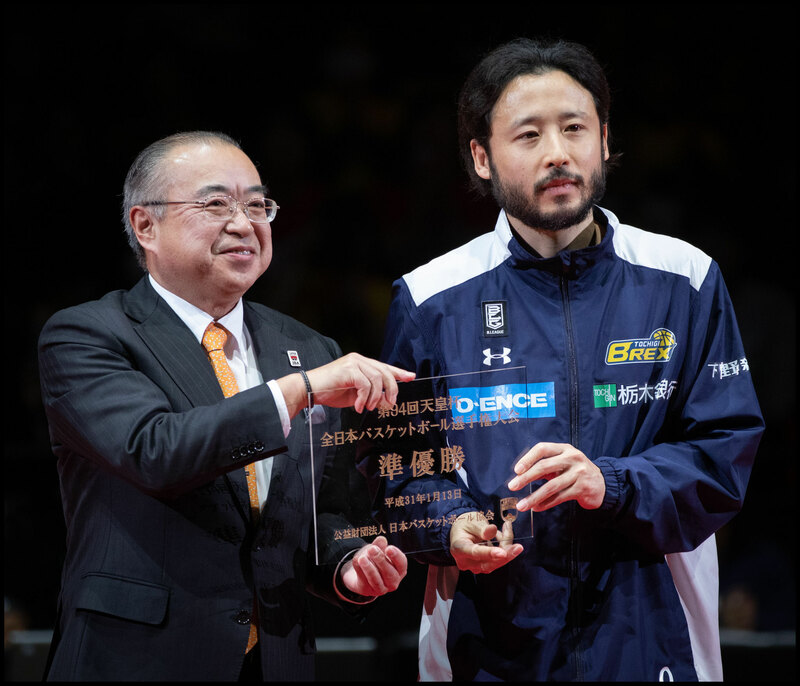 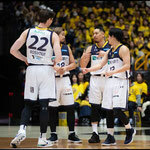 Togashi and Edwards were both named to the all-tournament team for the second year in a row, and were joined by Tochigi's Endo and Rossiter along with Tokyo's Yudai Baba. 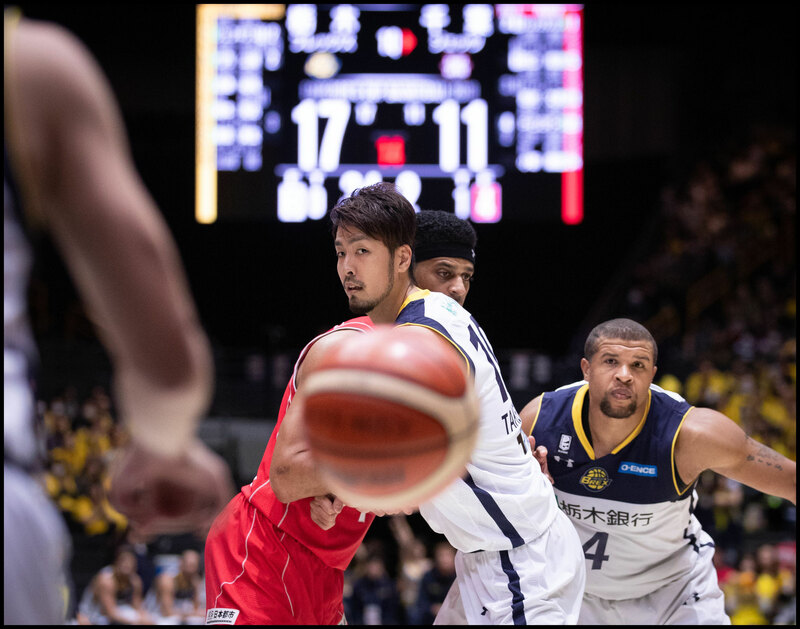 For the Jets, the focus will now be on finally following up its success in the Emperor's Cup with a first-ever B.League title. 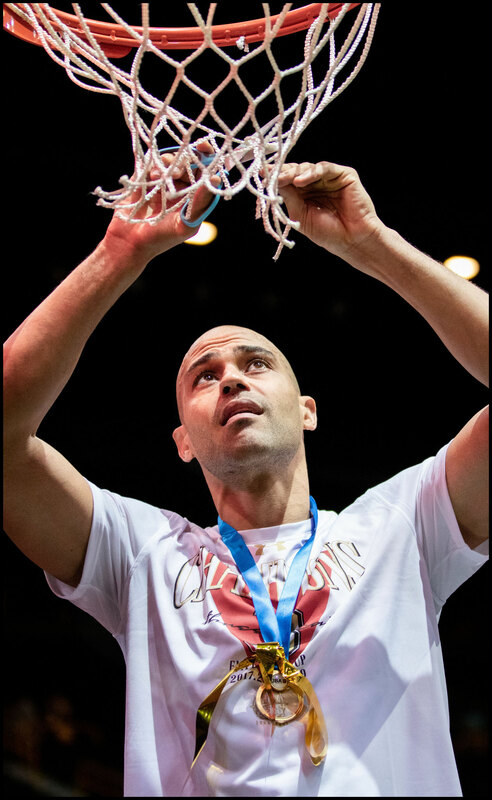 "In all honesty, we have been a really good team, we just haven't had the luck to get it done in the playoffs," Parker said. 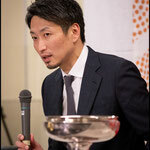 "But we can win cups and we can win big games in the regular season when we need to, and then in the playoffs, it seems like we have bad luck."